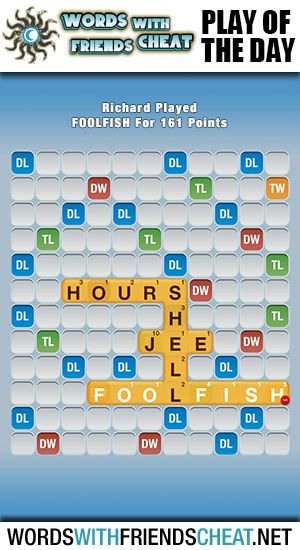 Today’s Words With Friends – Play Of The Day is FOOLFISH (161pts) and was submitted by Words With Friends Cheat user Richard. Using his entire rack to connect one marine word to another, Richard’s play spanned a triple word, triple letter, and a double word to secure a whopping 161 total. 1. relating to filefish (any of several flattened marine fishes of the family Monacanthidae, having an elongated head with a small mouth and small, spiny scales. ).